Reena Gupta serves as Accounting Manager for GEO Foundation. Her responsibilities involve financial statements, month end closing entries, data entries, property taxes, bank reconciliations, fixed assets, and depreciation schedules for the GEO Foundation and its schools. 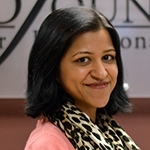 Reena received her undergraduate degree in Finance and Accounting from Virginia Commonwealth University in Richmond, VA. Not only has she obtained her Post-Baccalaureate Certification Program in Accounting, she also currently serves as a member of the Golden Key International Honors Society and INCPA Society. Reena enjoys working for non-profit organizations because she appreciates making a difference within her community. Her prior work experience includes being an Accountant in a non-profit organization in Richmond, VA where she aided woman in becoming small business entrepreneurs. She also has experience in the retail and banking industries. Reena enjoys playing tennis, hiking, watching movies, going on long and calm walks, and playing poker with her family and friends.